Servers are the heart of your business network. Computers in a network access and share files from the servers. Some servers are dedicated to specific needs like marketing or accounting. 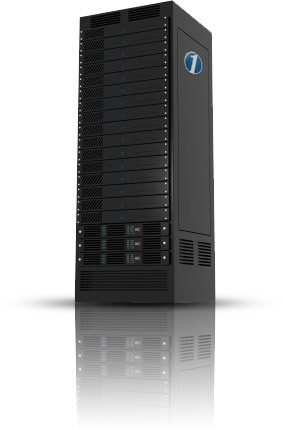 At 1 Call Service, we work with all the top vendors for servers: Dell, HP, Compaq, IBM/Lenovo and powered INTEL or AMD. There was a time when we would always recommend Dell, but we have found that by purchasing INTEL direct there is a 3 year warranty out of the box without any extra charges. Dell and others usually buy INTEL direct and charge extra for a 3 year warranty at a cost of couple hundred extra dollars per server. We now compare the current offers available from Dell, HP, Compaq, Lenovo to see what is the best value. We deliver custom INTEL servers, the industry standard. Superior server solutions at a value price. By using INTEL or AMD you are buying the industry standard server components and steering clear of proprietary issues. You won’t have to spend 4 hours trying to figure out the glitzy name brand website and 30 minute offers. We are INTEL Product Dealers and AMD partners giving you a wider range of choices so your company benefits with the very best solution to your server needs. We will clearly show you the best value and then follow through with installation and staff training so you have a reliable computing environment! What is Dual Core and Quad Core? The market for servers has moved from single core to multiple core technology which is really good for buyers, for obvious reason. Dual and quad core can best be explained by thinking about a car. A single engine car is fine but if you could stuff 2 or 4 engines in the same space under the hood, then your car would be that much more capable. That is the essence of multi-core processor technology driving servers: Stuffing more engines in the same space! This results in a production cost savings so buyers get more power in the same footprint in the computer room or data center. Load balancing features can be added for high performance needs. The opportunity provided by the advances in processors and Windows Server means your business can consolidate and simplify your network environment while getting the latest software to run your business! Stand alone or virtual servers are just a call away.